If we want to change the speed of a clip in FCP we can select the clip in the TL and from the Modify menu choose Speed. This will open the Speed dialog box which will allow you to change the speed of the clip and also allow you to run the clip backwards. This effect is very limited in that you can only change the speed of the clip once. If you want to have the clip change speed more that once like speed up, slow down and speed up again you will have to razor blade the clip into three pieces and then apply a different speed change to each of the pieces. Not only time consuming but the speed shifts between the three pieces can be a bit awkward. 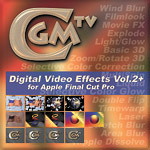 The Timewarp filter is one of a set of 35 Digital Video Effects Filters for Final Cut Pro by CGM. Drop the Timewarp filter onto your clip, double click the clip to load it into the Viewer and select the Filters tab. In the control window (below left) I have 'Display Mode' set to Source and Destination. Mode is set to Destination TL and Show information is checked. Below this are the Marker and Speedfactor controls. While I only show three Markers below there are actually nine different markers allowing you to change the speed of a clip nine different times. Each marker can be given a frame number and a corresponding speed factor. The frame numbers have to be incremental. When the Display mode is set to Source and Destination this setting will show up in the Canvas widow (below right). Set the Canvas window to 'image' only. In my example, the playhead is set to the first frame of the clip on the TL. If you will look at the Source Frame side of the Canvas you will see that it shows frame '0', the first frame of the clip. Just ignore the Destination part of the Canvas window. As you move the playhead through the clip on the TL you will see in the Source side of the Canvas, that the video frames update in the red box. The frame number reflects the position of the playhead on the clip. You can scrub through the TL to find each exact frame that you want to position a speed change. I want my clip to start at normal speed and ramp up to five times normal speed at frame number 179. I leave Marker number 1 at it's default setting (below left), frame = 0, first frame of the clip and speedfactor = 1, 1 being normal speed. Click on both Keyframe buttons for Marker 1. Now I scrub through the TL to find the position for my speed change. The frame I want is number 179. In the Marker 2 area (below middle) I set the Marker (frame number) to 179, below that I enter 5 into the Speedfactor. When I hit the 'enter' key on my keyboard the keyframes will be set. You can set new keyframes by using the Keyframe buttons. Using the Keyframe buttons at every Marker makes it easier to see your work as it progresses as the Keyframes are visible in the timeline of the Viewer. The Source section in the Canvas window will now show Marker 1 at the starting frame with a normal speed and Marker 2 at frame 179 with the ramp to five times normal speed, (below right). The red vertical line (Blue arrow) shows the current position of the playhead in the TL. Now I want to return my speed to normal so I scrub the TL til I find the frame I want, in this case it's frame number 281. 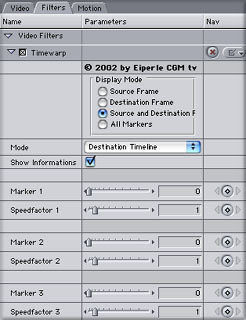 In the Marker 3 area (below left) I enter frame number 281 and set Speedfactor back to 1 (normal speed), hit enter. The Source (below right) now shows the third Marker at frame 281 and speed ramped back to normal. My last speed adjustment, Marker 4, will be to ramp from normal speed at frame number 281 up to 10 times normal speed at the end of the clip which is frame number 502. Render and your done. The Timewarp filter is not 'time mapped' to the TL. Let me explain. Let's say that we have a clip that is 20 seconds long on the TL. We use the Timewarp filter to do some speed changes and the total duration of the speed modified clip is now 10 seconds. Even though the clip will play for 10 seconds, the clip on the TL is still 20 seconds long. The length of the clip on the TL is not redrawn (time mapped) to reflect the new running time. After render, when we play the clip, the clip will play out in 10 seconds. However, the playhead will only be half way through the clip and will continue to play for the remaining 10 seconds. Okay, so what plays for the remaining 10 seconds? There are two possibilities. 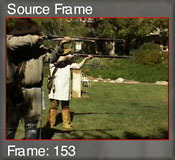 If there is no extra video material past the out point of the clip, no handle, then the very last frame of the clip will become a freeze frame and will remain on screen for 10 seconds. If there is material past the out point of the clip, then this material will be used until it is used up and then you will get a freeze frame. In either case this is probably not what you want. Place your playhead on the clip in the TL and find the last frame before the out point or where the freeze frame starts playing. Get out your razor blade, cut at that point and delete the section that is to the right of the playhead. Now the length of the clip on the TL will match the playing time of the clip. For clip speeds slower than normal, set your Speedfactor to less than 1. '0' equals full stop. If somewhere in your clip you bring your video to a full stop it will be necessary to razor blade the clip at that point and reapply the Timewarp filter to the second part of the clip as Timewarp will not start back up once 0, full stop has been instituted. With the Timewarp filter 'Frame Blending' is applied automatically if the speed is set to less than 1 (normal speed). 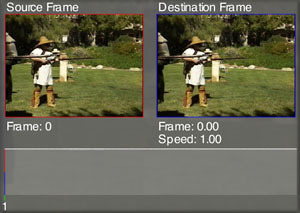 For flicker free 'slow motion' videos add the FCP Flicker-Filter; Video Filters > Video > Flicker Filter. Be sure to place it below the Timewarp filter. For best results set the Flicker filter to maximum. To Purchase the Timewarp plugin by itself The Time Collection $19. You can purchase CGM DVE Vol.2+ full package from the lafcpug store.